Lisa Gunterman is the Director for the LGBT Center on our Belknap campus. A lifelong social justice organizer with 25 years of experience in non-profit and government sectors, Lisa brings a wealth of experience and passion to the job. As a co-founder of Louisville's Fairness Campaign, Lisa played a key role in passing the city's ordinance banning discrimination based on sexual orientation and gender identity. Primary responsibilities for the Center include directing programs like Pride Week, Ambassadors, PINK, Alternative Thanksgiving, and educational trainings. Honors include: Congressional Recognition, Congressman Yarmuth, 2011; Co-Grand Marshall, Kentuckiana Pride Parade, 2011; Distinguished Citizen, Louisville Mayor Greg Fischer, 2011; Youth Service Worker Award, Louisville Mayor Dave Armstrong, 2000; Certificate of Merit, Louisville Board of Aldermen, 2000; Stonewall Award, Louisville, 1993. You can reach Lisa by email here. Bláz Bush serves as the Director of the LGBT Center on our Health Sciences Center Campus. A graduate of the University of Oklahoma, Bláz has a Master’s degree in Education specializing in Community Counseling. His career in LGBTQ Healthcare began almost a decade ago with the New York Blood Center’s Project Achieve recruiting and counseling individuals on HIV Vaccine research, sexual behavioral health research, and HIV/AIDS testing. He most recently served as the Director of Care Coordination at Callen-Lorde Community Health Center, one of the largest LGBT Community Health Centers in the world serving 18,000 LGBT patients annually in a fully integrated health model. At Callen-Lorde, Bláz oversaw a passionate team of forty case managers, patient navigators, and prevention and outreach counselors. He also led the health center in a number of pivotal initiatives including improving community HIV viral suppression rates, rapid treatment for HIV, developing interventions to improve community outcomes by addressing social determinants of health, and assisting in the creation of a transgender gender affirming surgery psychoeducational clinic. His primary responsibilities for the LGBT Center include strategic planning for the Center's HSC activities, coordinating the eQuality Project with the School of Medicine, developing new partnerships with HSC faculty, staff, and students, and providing training on LGBT health topics to all schools on the Health Sciences Center campus. Bláz also brings a passionate dedication to work with the community, faculty and staff to develop and open the University of Louisville LGBTQ Health Clinic. You can reach Bláz by email here. 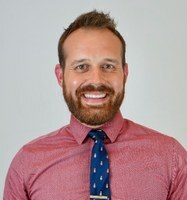 Aaron Weathers is the Assistant Director for the LGBT Center Health Sciences Campus. 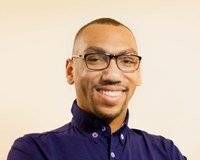 As a 2013 graduate of the University of Louisville, Aaron was a member of the UofL Debate Team and an active student in the LGBT Center’s early days. As a co-founder of the student organization, Blkout, Aaron was a recipient of the Katy Garrison LGBT Student Leadership Award. Aaron holds his Bachelor’s in Pan-African Studies with a concentration in women, gender, and sexuality studies. He received his Master’s in Communication from California State University Fresno in 2017. Aaron uses he/his/him or they/them pronouns interchangeably. You can reach Aaron by email here. Katy Garrison is the Assistant Director for the LGBT Center Belknap campus. An activist, mentor, and 2011 graduate of the University of Louisville, Katy played an active role in the launch of the LGBT Center in 2007. She holds a Bachelor's degree in Sociology with minors in Communication and Women and Gender Studies and is currently pursuing an MS in Health Administration from the U of L School of Public Health and Information Sciences. 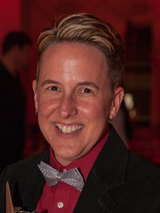 In 2010 she was hired as U of L Health Promotion's first-ever LGBT Liaison. Upon graduation, she received the Katy Garrison LGBT Student leadership award for her work and devotion to the university and the LGBT campus community. She currently serves as adviser to the Bayard Rustin LGBT and Social Justice Themed Housing Community, adviser to Transformations and Aces & Aros, coordinator and facilitator for the Speak Out Team, and primary trainer for the Safe Zone Project on the Belknap Campus.